VISITORS isï¿½the film by acclaimed director Godfrey Reggio with an original score by Philip Glass performed by the Bruckner Orchester Linz conducted by Dennis Russell Davies. Glass and Reggio have a collaborative relationship dating back over thirty years including past collaborations on Koyaanisqatsi, Powaqqatsi, and Naqoyqatsi. 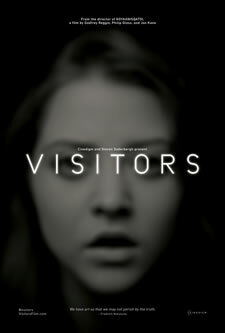 VISITORS is Reggioï¿½s first film in over a decade and inspired an elegant evocative score from Glass. This recording was made in Linz Austria with the Bruckner Orchester Linz and conductor Dennis Russell Davies (featured on Glass Symphonies Nos.6, 7, 8, and 9 and the opera The Voyage on OMM) and was produced by long-time Glass producer Kurt Munkacsi.